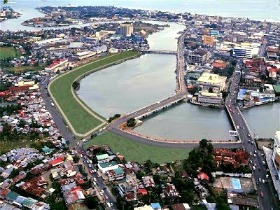 Rivers in major urban areas of the Philippines are unfit for human activities but there are bright spots such as this city’s major tributary – the Iloilo River which is fast becoming an exception to the rule. This is according to Department of Environment and Natural Resources Undersecretary Demetrio Ignacio, Jr. during the first International River Summit held in Iloilo City. “We consider the Iloilo River as among the most improved rivers in the country,” Ignacio told the more than 1,000 participants of the summit coming from various parts of the world and local government units. He said that to clean, rehabilitate and revive a river, lots of science and resources are needed, but even with all these, success is not assured, unless there is political will. Ignacio lauded Senator Franklin Drilon for his efforts whom he named as the “Architect of the successful rehabilitation of Iloilo River” as well as Mayor Jed Mabilog being the lead implementer of the rehabilitation and river clean up. Drilon with the support of the city government and concerned government agencies initiated clean-up and development efforts that will further beautify and rehabilitate the waterway. Among these developments is the Iloilo River Esplanade project which was visited by President Benigno Aquino III when he came here for the closing ceremony of the summit and the inauguration of the new Iloilo City hall. The esplanade, involving a road widening of the 1.2 kilometer Trenas Boulevard from Diversion Road features a view deck, park, fountain, lamp post and a giant Dinagyang warrior that signifies the city’s famous festival held every January. When completed, it will also provide a space to residents and visitors for recreation complete with stalls and restaurants. It is also expected to ease traffic as this will serve as a walkway and a road for bikes. With these efforts, Ignacio said that “it is only fitting that this first International River Summit was held here in Iloilo City”. Ignacio also cited the different initiatives being implemented by the government involving the private sector and other concerned government agencies in protecting the river system. As one of these initiatives, he said President Aquino has imposed a nationwide total log ban in the natural forests last year and launched the National Greening Program which is the biggest reforestation in the country’s history. “To protect our river system, we need to go upland, to our forests,” said Ignacio. NGP involves the planting of 1.5 billion trees in 1.5 million hectares from 2011 to 2016. Last year, more than 90 million trees were planted and 364,000 jobs were generated under the program. “This year, we will double this. We will triple this. By 2016, we expect to reverse our forest situation whereby we will have more forest areas than degraded areas,” said Ignacio. He added that already, the Food and Agriculture Organization of the United Nations is regarding the Philippines as having the third fastest growing forest among economies. The 2012 Environmental Performance Index prepared by Yale University and the Colombia University in the United States has ranked the Philippines as a “strong performer”, outranking the US, Australia, South Korea and Singapore. The study gave the Philippines perfect scores in growing forest stock and forest cover. Ignacio said the support of private corporations was enlisted in river clean up projects. So far, some 260 corporations have enlisted to clean 160 rivers and water bodies. Further, a water convergence program was also embarked on involving agencies dealing with the environment, agriculture, public works and local government to catch water upland and divert it to support food production. This also intends to address flooding problem. Ignacio said the government has so many programs related to water, river rehabilitation and river clean up. But whatever government does will not be enough unless there are adequate resources, appropriate technologies and the support and cooperation of the people. Speaking directly to the delegates, Ignacio said “The challenges facing our rivers are plenty, complex and daunting. The innovative ideas, the appropriate models and the best practices that will be discussed in this summit will guide all of us in developing a road map towards better management of our river system”.